This prayer below, devoted to Mary's Seventh Sorrow, is the last of a set of seven that was approved by Pope Pius VII in 1815. The set concludes with the familiar verse/response pattern for groups, (but you can say each of these lines by yourself, of course!) followed by a closing prayer. In this Seventh Sorrow, we see a day so dreadful and yet, at the same time, so important for our redemption finally coming to a close! 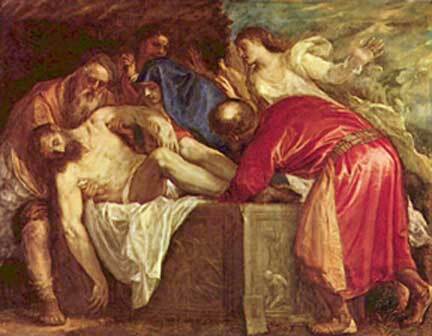 Scripture tells us of how Joseph of Arimathea, a distinguished member of the Jewish Sanhedrin but secretly a disciple of Jesus, took down our Lord’s body from the cross, wrapped it in a clean linen cloth, and laid Him in a new tomb hewn out of a rock in a garden in which no one had yet been buried. How could anyone not feel immense heartache like Mary’s at this scene? Christ would also tell the disciples on the road to Emmaus that His Passion was necessary for Him to enter into His glory. (Luke 24:26). Indeed, Jesus had predicted several times during His earthly ministry that His Resurrection would follow His Passion and Death. His apostles couldn’t really grasp what He was saying, however. For example, after they witnessed His Transfiguration, (see here for details) Jesus told Peter, James, and John not to say anything about this awesome miracle until after He had risen from the dead. We read in Mark’s Gospel that they didn’t understand what he meant by that! (Mark 9:10). Could any of us have really understood Him if we’d been in that situation? Certainly the chief priests and the Pharisees who insisted the Romans crucify Jesus didn’t understand Him! After His death they specifically asked Pontius Pilate to place both a stone and a guard in front of Christ’s tomb “lest His enemies come and steal His body and say He is risen” (Matt 28:64). Pilate grated their request, inadvertently giving us quite tangible evidence that our Lord did indeed conquer death. After all, when Mary Magdalene and the other holy women came to anoint His body on that incredible Sunday morning, we read in Matthew’s Gospel that an earthquake rolled away the stone and then an angel sat on it (Matt 28:2). And there was no one in the tomb! As with all these approved private revelations from St. Bridget and others, we are not required to believe in them as Catholics the way we would the Nicene Creed, for example, but the thoughts expressed here certainly are inspiring and can give us great hope! After all, Christ fulfilled His mission for our salvation in His death, that His Resurrection may one day be ours as well! As St. Jerome once said “by Christ’s burial we will rise again.” May this great hope help us all to live as “citizens in training” for heaven through prayer, obedience to His will, and the love we show Him, Our Blessed Mother, and each other as well!